The Guggenheim Museum Bilbao presents Henri Michaux: The Other Side, an exhibition which brings together a prominent set of works by an unclassifiable figure of the arts and literature of the 20th century. Over the course of his long life, Henri Michaux (Namur, Belgium, 1899–Paris, France, 1984) greatly influenced the artists and writers of his time, both as a ―poets‘ poet‖ and a ―painters‘ painter‖, lionized by figures in both fields like André Gide and Francis Bacon. Michaux feverishly produced thousands of works on paper whose full extent is only now becoming apparent. This exhibition, organized in collaboration with the Michaux Archives in Paris, covers sixty years of Michaux‘s creative activity, focusing on his most important periods and series. Bringing together some 230 of the artist‘s pieces, documents and objects, Henri Michaux: The Other Side is organized around three principal themes, offering a panoramic view of each: the human figure, the alphabet and the altered psyche. texts in Spanish and Basque by Henri Michaux and the neurologist from Bilbao, Julián de Ajuriaguerra, the artist‘s associate in the 1950‘s and a key Basque figure in psychiatry who died 25 years ago. An indefatigable experimenter and traveler, Michaux entered the world of painting thanks to the works of Paul Klee and Max Ernst, with whom he first came into contact in the early 1920s. The writer‘s tools, ink and paper, were his first resources in the pictorial adventure, but he soon developed techniques that are now regarded as characteristic of his work, such as gouache on a black background and the use of frottage. In his later period he worked in oil and acrylic. He also made singular use of watercolor and ink on many different types of paper. These techniques had the common feature of fluidity and a propensity for accidents and overflowing, both desirable for an artist who always sought the intervention of chance in his works as a way of collaborating with unknown forces. With an ascetic and systematic spirit, the same impulse prompted Michaux to try hallucinogenic substances in order to observe the behavior of the conscience in experimental conditions. In this way, he took the principles of his painting to the senses themselves. For Michaux, painting is that other side of which the artist draws an infinite map. To use his own words, Michaux always painted ―to surprise himself.‖ He never believed in predefined results, but rather sought to provoke indefinable events in his material, causing the emergence of ambiguous and unexpected figures, signs, and landscapes. In a celebrated statement on ―the phenomenon of painting‖ in which he denied affiliation to any school or tendency, he admitted that the only movement he might be ascribed to would be fantomisme (‗phantomism‘): an art of ghosts and apparitions. Undefined beings thus appear throughout all his work, with a special abundance of imaginary portraits. Focusing on this classic genre, this gallery contains a wide selection of works in which Michaux‘s figures come out of the infinite depth of the paper to meet the artist and the viewer. in many different directions. Michaux cultivated his interest in pictographic scripts at the same time as he developed his passion for sound rhythms and patterns. Although he was a keen amateur musician, no document remains of his musical practice except for his drawings, which sometimes look like scores. In these works we find an abstract and intimate literature where the signs are figures in constant mutation. On many occasions these signs appear as separate letters, while at other times they develop animal or totemic features; in still further cases, like the period of experimentation with psychoactive substances in the 1950s and 1960s, the lines multiply over large areas of paper, acquiring connotations that align them with the practices of Abstract Expressionism. In 1955, at a mature age, Michaux took part for the first time in an experiment with mescaline, an alkaloid extracted from the Mexican cactus known as peyote. Michaux was assisted for the purpose by doctors and scientists close to the literary world, including a neurologist from Bilbao, Julián de Ajuriaguerra. Dazzled by the psychic and sensorial mutations caused by this and other psychoactive substances, such as psilocybin and LSD 25, Michaux underwent numerous sessions up to the early 1960s, reflecting them in such well-known literary works as Miserable Miracle and Infinite Turbulence. At the same time, he produced a large number of minute drawings following a graphic matrix already intuited in previous years. This was a pattern of furrows and arborescences, often ascending, saturated with symmetries and micrographs. Both these graphic works and his literary output brought Michaux to prominence as a doyen of the incipient psychedelic culture and the underground mystique, although he always insisted on defining himself as a sober―water drinker‖ with no interest whatsoever in artificial paradises. 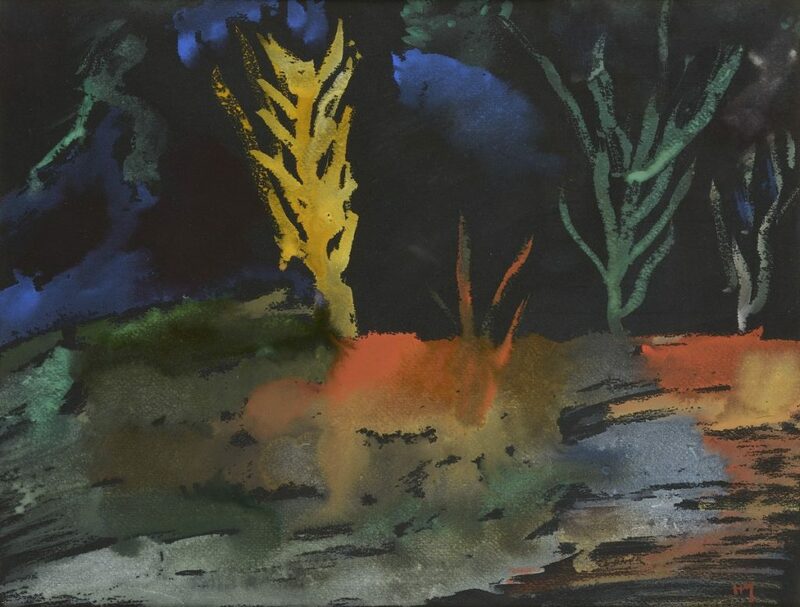 In the years after he stopped experimenting with chemicals, Michaux continued to develop a ―mescaline‖ style while working at the same time on his other series and his great artistic obsessions. In all of them he found fertile ground for the cartography of the imagination.